Gypsy moth is the common name for a type of tussock moth, Lymantria dispar that is native to Europe and Asia but has become a serious pest in North America after its introduction in the 19th century. In their natural environment, where gypsy moths have developed in harmony with numerous predators, they are part of the balance of nature. They serve as prey species for such animals as predatory and parasitic insects (wasps, ground beetles, etc. ), spiders, birds, and mammals such as mice, shrews, and squirrels. However, the introduction of gypsy moths by humans into North America has proven very destructive, with millions of acres of trees defoliated, including both evergreen and deciduous trees, and many trees weakened or killed by repeat infestations. Over one million acres (4,000 km²) of forest each year were defoliated between 1980 and 1991, and in 1981 almost 13 million acres were defoliated (52,200 km²) (McManus et al. 1992). There remain important North American predators, some of which are drawn to infestations. Nonetheless, this introduction remains a significant threat, with concern about spreading to new areas, and outbreaks requiring a massive amount of money and effort to contain. Awareness of such problems, however, has lead to greater quarantine laws and efforts to restrict the introduction of invasive species between nations. 8.1 Silvicultural treatment: What and when? The gypsy moth, Lymantria dispar, is a member of the Lymantriidae family of the insect order Lepidopera (butterflies and moths). Lymantriidae (or Liparidae) includes about 350 known genera and over 2,500 known species found all over the world, in every continent except Antarctica. Adult moths of this family do not feed. They usually have muted colors (browns and grays), although some are white, and tend to be very hairy. Some females are flightless, and some have reduced wings. Usually the females have a large tuft at the end of the abdomen. The males, at least, have tympanal organs (Scoble, 1995). They are mostly nocturnal, but Schaefer (1989) lists 20 confirmed diurnal species and 20 more likely diurnal species (based on reduced eye size). Gypsy moths are diurnal. The larvae of the Lymantriidae family are also hairy, often with hairs packed in tufts, and in many species the hairs break off very easily and are extremely irritating to the skin. This highly effective defense serves the moth throughout its life cycle as the hairs are incorporated into the cocoon, from where they are collected and stored by the emerging adult female at the tip of the abdomen and used to camouflage and protect the eggs as they are laid. In others, the eggs are covered by a froth that soon hardens, or are camouflaged by material the female collects and sticks to them (Schaefer, 1989). In the larvae of some species, hairs are gathered in dense tufts along the back and this gives them the common name of tussocks or tussock moths. Adult gypsy moths are sexually dimorphic, with males light to dark brown with irregular black markings, and females all white with irregular black lines on the wings (Grzimek et al. 2004). Males, which are active fliers, have a wingspan of about 1 to 1.5 inches (25.4 to 38 millimeters), while females, which do not fly (except for the larger Asian variety) have a wingspan of about 2.24 to 2.68 inches (56 to 67 millimeters (Grzimek et al. 2004). Older larvae can be identified by the presence of five pairs of raised blue spots followed by six pairs of raised brick-red spots along their backs, and a sprinkling of setae. The normal range of gypsy moths is in the palearctic zone, with the exception of the extreme south or north (Grzimek et al. 2004). The Palearctic includes the terrestrial ecoregions of Europe, Asia north of the Himalaya foothills, northern Africa, and the northern and central parts of the Arabian Peninsula. The gypsy moth is now in North America as a result of being an introduced species. 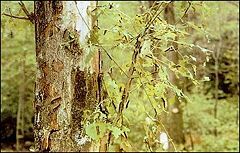 Lymantria means "defiler," and gypsy moths, as with some other members in Lymantriidae and in Lymantria, are important defoliators of forest trees. As with other moths, gypsy moths undergo complete metamorphosis. Complete metamorphosis, also called holometabolism and complex metamorphosis, is a term applied to those processes in which the larvae differ markedly from the adults. Insects that undergo holometabolism start as an egg, pass through a larval stage (known as a caterpillar), then enter an inactive state called pupa (chrysalis), and finally emerge as adults (imago). In the gypsy moth, there is one generation per year. Gypsy moth egg masses are typically laid on branches and trunks of trees, but egg masses may be found in any sheltered location. During outbreaks, the moths have been known to lay their eggs on the ships. Four to six weeks later, embryos develop into larvae. The egg is the overwintering stage. After an acclimation stage, eggs can withstand freezing temperatures. The longer they are chilled in winter, the less heating is required for their hatch in spring. Egg masses are buff colored when first laid but may bleach out over the winter months when exposed to direct sunlight and weathering. As the female lays them, she covers them with hair-like setae from her abdomen. Many individuals find these hairs irritating, and they may offer the eggs some protection. Egg masses contain from a couple of hundred to about 1200 eggs. The hatching of gypsy moth eggs coincides with budding of most hardwood trees. Larvae (caterpillars) emerge from egg masses from early spring through mid-May. Gypsy moths are dispersed in two ways. Natural dispersal occurs when newly hatched larvae hanging from host trees on silken threads are carried by the wind for a distance of up to about 1 mile, although most go less than 50 meters. Eggs can be carried for longer distances. Artificial dispersal occurs when people transport gypsy moth eggs thousands of miles from infested areas on cars and recreational vehicles, firewood, household goods, and other personal possessions. Females are flightless in most varieties, so these are the only means of spreading. Larvae develop into adults by going through a series of progressive molts, through which they increase in size. Instars are the stages between each molt. Male larvae normally go through five instars (and females, six) before entering the pupal stage. Newly hatched larvae are black with long hair-like setae. During the first three instars, larvae remain in the top branches or crowns of host trees. The first stage or instar chews small holes in the leaves. The second and third instars feed from the outer edge of the leaf toward the center. Older larvae have the characteristic blue (5 pairs) and red (6 pairs) of spot on their dorsal surface. When population numbers are sparse, the movement of the larvae up and down the tree coincides with light intensity. Larvae in the fourth instar feed in the top branches or crown at night. When the sun comes up, larvae crawl down the trunk of the tree to rest during daylight hours. Larvae hide under flaps of bark, in crevices, or under branches—any place that provides protection. When larvae hide underneath leaf litter, mice, shrews, and Calosoma beetles can prey on them. At dusk, when the sun sets, larvae climb back up to the top branches of the host tree to feed. When population numbers are dense, however, larvae feed continuously day and night until the foliage of the host tree is stripped. Then they crawl in search of new sources of food. The larvae reach maturity between mid-June and early July and then enter the pupal stage. This is the stage during which larvae change into winged adults. Pupation lasts from 7 to 14 days. When the population is spread out and running low, pupation can take place under flaps of bark, in crevices, under branches, on the ground, and in other places where larvae rested. During periods when population numbers are dense, pupation is not restricted to locations where larvae rested. Pupation will take place in sheltered and non-sheltered locations, even exposed on the trunks of trees or on foliage of nonhost trees. Usually the caterpillars create flimsy cocoons made of silk strands holding the leaf together, while others do not cover their pupae in cocoons, but rather hang from a twig or tree bark, like butterfly pupae do. The brown male gypsy moth, upon emerging, flies in rapid zigzag patterns searching for females. The male gypsy moths are diurnal unlike most moths, which are nocturnal. When heavy, black-and-white egg-laden females emerge, they emit a chemical substance called a pheromone that attracts the males. After mating, the female lays her eggs in July and August close to the spot where she pupated. Then, both adult gypsy moths die. The European and most Russian forms of the gypsy moth have flightless females. Although they have large wings, the musculature is not developed. However, the Japanese gypsy moth females do fly and are attracted to lights. Gypsy moths (at least of the introduced American population) fly all day and night, with the possible exception of the late morning. They are most active soon after dusk and in the latter hours of the night (Fullard and Napoleone 2001). The gypsy moth was introduced into the United States in 1868 by a French scientist, Leopold Trouvelot, living in Medford, Massachusetts. The native silk spinning caterpillars were proving to be susceptible to disease. So Trouvelot brought over gypsy moth eggs to try and make a caterpillar hybrid that could resist diseases. When some of the moths escaped from his lab, they started to multiply. They eventually grew to be gypsy moths as we know them today. It is now one of the most notorious pests of hardwood trees in the Eastern United States. The first outbreak there occurred in 1889. By 1987, the gypsy moth had established itself throughout the Northeast USA and southern Quebec and Ontario. The insect has spread south into Virginia and West Virginia, and west into Michigan, Wisconsin, and Minnesota. Some gypsy moths were likewise introduced into the northwestern North America in 1991. Small, isolated infestations have occurred sporadically in Utah, Oregon, Washington, California, and British Columbia, but these have all been successfully eradicated. Between 1980 and 1991, the gypsy moth defoliated over 1,000,000 acres (4,000 km²) of forest each year (McManus et al. 1992). In 1981, a record 12,900,000 acres (52,200 km²) were defoliated. This is an area larger than Rhode Island, Massachusetts, and Connecticut combined. In wooded suburban areas, during periods of infestation when trees are visibly defoliated, gypsy moth larvae crawl up and down walls, across roads, over outdoor furniture, and even inside homes. During periods of feeding they leave behind a mixture of small pieces of leaves and excrement. During outbreaks, the sound of chewing and excrement dropping is a continual sound. Gypsy moth populations usually remain at very low levels but occasionally populations increase to very high levels which can result in partial to total defoliation of host trees for one to three years. Gypsy moth larvae generally prefer oaks, but may feed on several hundred different species of trees and shrubs, both hardwood and conifer. In Eastern North America, the gypsy moth prefers oaks, aspen, apples, sweetgum, speckled alder, basswood, gray, and paper birch, poplars, willows, and hawthorns, although other species are also affected. The list of hosts will undoubtedly expand as the insect spreads south and west. 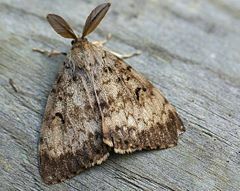 The gypsy moth avoids ash trees, tulip-tree, American sycamore, butternut, black walnut, catalpa, flowering dogwood, balsam fir, arborvitae, American holly, and shrubs such as mountain laurel and rhododendrons, but will feed on these in late instars when densities are extremely high. Older larvae feed on several species of hardwood that younger larvae avoid, including cottonwood, hemlock, Atlantic white cypress, and the pines, and spruces native to the East. The effects of defoliation depend primarily on the amount of foliage that is removed, the condition of the tree at the time it is defoliated, the number of consecutive defoliations, available soil moisture, and the species of host. If less than 50 percent of their crown is defoliated, most hardwoods will experience only a slight reduction (or loss) in radial growth. If more than 50 percent of their crown is defoliated, most hardwoods will refoliate or produce a second flush of foliage by midsummer. Healthy trees can usually withstand one or two consecutive defoliations of greater than 50 percent. Trees that have been weakened by previous defoliation or been subjected to other stresses such as droughts are frequently killed after a single defoliation of more than 50 percent. Trees use energy reserves during refoliation and are eventually weakened. Weakened trees exhibit symptoms such as dying back of twigs and branches in the upper crown and sprouting of old buds on the trunk and larger branches. Weakened trees experience radial growth reduction of approximately 30 to 50 percent. Trees weakened by consecutive defoliations are also vulnerable to attack by disease organisms and other insects. For example, the Armillaria fungus attacks the roots, and the two-lined chestnut borer attacks the trunk and branches. Affected trees will eventually die two or three years after they are attacked. 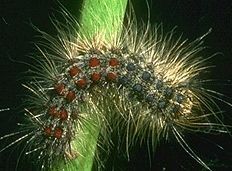 Although not preferred by the larvae, pines and hemlocks (as the term is used in North America) are subject to heavy defoliation during gypsy moth outbreaks and are more likely to be killed than hardwoods. A single, complete defoliation can kill approximately 50 percent of the pines and 90 percent of the mature hemlocks. This is because conifers do not store energy in their roots; an exception is larch. Natural enemies play an important role during periods when gypsy moth populations are sparse. Natural enemies include parasitic and predatory insects such as wasps, flies, ground beetles, and ants; many species of spiders; several species of birds, such as chickadees, blue jays, nuthatches, towhees, and robins; and approximately 15 species of common woodland mammals, such as the white-footed mouse, shrews, chipmunks, squirrels, and raccoons. Predation by small mammals (mice and shrews) is the largest source of mortality in low density gypsy moth populations and this mortality is apparently critical in preventing outbreaks. Calosoma (ground beetles of European origin), cuckoos, and flocking birds, such as starling, grackles, and red-winged blackbirds, are attracted to infested areas in years when gypsy moth populations are dense. Diseases caused by bacteria, fungi, or viruses contribute to the decline of gypsy moth populations, especially during periods when gypsy moth populations are dense and are stressed by lack of preferred foliage. Wilt disease caused by a particular nucleopolyhedrosis virus (NPV) that is specific to the gypsy moth is the most devastating of the natural diseases. NPV causes a dramatic collapse of outbreak populations by killing both the larvae and pupae. Larvae infected with wilt disease are shiny and hang limply in an inverted "V" position. Infection with NPV is the most common source of mortality in high density populations, and NPV epizootics usually cause the collapse of populations. Since the 1980s, the fungus Entomophaga maimaiga has also had a large impact on gypsy moth populations in North America. Weather affects the survival and development of gypsy moth life stages regardless of population density. For example, temperatures of -20°F, (-29°C.) lasting from 48 to 72 hours can kill exposed eggs; alternate periods of freezing and thawing in late winter and early spring may prevent the over wintering eggs from hatching; and cold, rainy weather inhibits dispersal and feeding of the newly hatched larvae and slows their growth. A number of tactics have the potential to minimize damage from gypsy moth infestations and to contain or maintain gypsy moth populations at levels considered tolerable. These tactics include monitoring gypsy moth populations, maintaining the health and vigor of trees, discouraging gypsy moth survival, and treating with insecticides to kill larvae and protect tree foliage. The tactic or combination of tactics used will depend on the condition of the site and of the tree or stand and the level of the gypsy moth population. Tactics suggested for homeowners are probably too costly and too labor intensive for managers to use in forest stands. The gypsy moth currently occupies less than 1/3 of its potential range in North America and considerable resources are directed at minimizing the expansion of its range into these areas. Every year, over 100,000 pheromone traps are placed in uninfested portions of the United States in order to detect new infestations that occasionally arise when people inadvertently transport life stages into uninfested areas (e.g., egg masses on recreational vehicles). When captures are positive for several consecutive years, this indicates that a population is establishing and these populations are eradicated, usually via the application of the bacterial pesticide, Bacillus thuringiensis ('Bt'). Enhance growth conditions for isolated trees by encircling them with mulch or ground cover plants that do not compete for moisture and nutrients the way dense grass layers do. Water the shade and ornamental trees in periods of drought to maximize recovery during refoliation. Avoid stressing trees. For example, construction projects tend to compact soil and prevent moisture from penetrating to small feeder roots. Avoid applying lime or weed killers around trees. These chemicals can seriously damage shallow tree roots. Thin the woodlot trees and groups of shade trees between outbreaks to reduce competition. deer mice. Deer mice are considered the most important predator of low-density gypsy moth populations and their abundance may be critical in determining whether populations go into an outbreak mode. Their abundance is strongly affected by the amount of mast (e.g., acorns) in the previous year. There is not any evidence that releasing or enhancing gypsy moth predators or parasites can reduce gypsy moth populations. Manual removal of gypsy moths may be a viable method for reducing damage on small, open-grown trees and shrubs. The number of visible egg masses. The percentage of preferred hosts in a mixed stand of trees (50 percent or more of oak). Whether trees already have dead or dying branches, especially near the top branches or crown. Whether the property is located adjacent to wooded areas heavily infested with gypsy moths. During periods when numbers of gypsy moth larvae are dense, pesticides may be the most effective method of reducing the number of larvae and protecting the foliage of host trees. Application of pesticides should be done by a certified applicator, because special equipment is required. Large areas, such as wooded residential areas and forests, should be treated by aircraft. Available pesticides fall into two broad groups: microbial or biological and chemical (table 1). Microbial and biological pesticides contain living organisms that must be consumed by the pest. Microbials include bacteria, viruses, and other naturally occurring organisms; biologicals include manmade synthetics of naturally occurring organisms. These pesticides should be applied before the larvae reach the third stage or instar of development. As they mature, larvae become more resistant to microbial pesticides and are, therefore, more difficult to kill. Low dose pheromone systems are being employed in some areas (Channel Islands, United Kingdom) to flood areas with synthetic pheromone and effectively "blind" males so they are unable to locate females. Nucleopolyhedrosis virus (NPV), a naturally occurring organism, has been developed as a microbial pesticide. It is presently registered under the name "Gypchek" and is available for use in USDA Forest Service sponsored suppression programs. NPV and Gypcheck are specific to the gypsy moth. Bacillus thuringiensis (Bt) is microbial and biological. It is the most commonly used pesticide. In addition to being used against the gypsy moth, Bt is used against a number of other pests, including the western spruce budworm and other Choristoneura, and tent caterpillars. When Bt is taken internally, the insect becomes paralyzed, stops feeding, and dies of starvation or disease. Chemical pesticides are contact poisons in addition to being stomach poisons. The timing of the chemical application is less critical to the successful population reduction of the pest than the timing of the application of the microbials and biologicals. Chemical pesticides can affect non-target organisms and may be hazardous to human health. Bacillus thuringiensis Dipel Thuricide Registered for aerial and ground application. Available under a variety of trade names. Toxic to other moth and butterfly larvae. Can be used safely near water. Acephate Orthene Registered for aerial and ground application. Available under a variety of trade names. Toxic to bees and some gypsy moth parasites. Commonly used from the ground to treat individual trees. Carbaryl Sevin Registered for aerial and ground application. Available under a variety of trade names. Toxic to bees and gypsy moth parasites. At one time, the most widely used chemical in gypsy moth control programs. Diflubenzuron Dimilin A restricted-use pesticide that can be applied only by certified applicators. The most commonly used chemical pesticides currently registered by the U.S. Environmental Protection Agency (EPA) for use against the gypsy moth contain carbaryl, diflubenzuron, and acephate. Malathion, methoxychlor, phosmet, trichlorfon, and synthetic pyrethroids (permethrin) have also been registered by EPA for control of gypsy moth, but are used infrequently. Several studies done by Peter G. Kevan and associates of the University of Guelph, between 1975 and 1995 in eastern Canada have shown serious reduction in blueberry and other crop pollination due to forest aerial applications of insecticides that killed non-target wild bees. Diflubenzuron represents a new class of pesticides called insect growth regulators. It kills gypsy moth larvae by interfering with the normal molting process. Diflubenzuron has no effect on adult insects. Aquatic crustaceans and other immature insects that go through a series of molting stages are often sensitive to this pesticide. Several interrelated factors determine the vulnerability of forest stands and woodlots to gypsy moth defoliation. An awareness of these factors will enable land managers and woodlot owners to prescribe silvicultural actions (such as thinning of a stand) that will minimize the impact caused by gypsy moth defoliation. Three of these factors include the abundance of favored food species (mainly oaks), site and stand factors, and tree conditions. Stands of trees that are predominantly oak and grow on poor, dry sites (such as sand flats or rock ridges) are frequently stressed and often incur repeated, severe defoliations. Trees growing under these conditions frequently possess an abundance of structural features such as holes, wounds, and deep bark fissures that provide shelter and habitats for gypsy moth larvae and aid their survival. Stands of trees that are predominantly oak but grow on protected slopes or on sites with adequate moisture and organic matter are more resistant to defoliation by the gypsy moth. Slow-growing trees on poor sites frequently survive a single, severe defoliation better than fast-growing trees typically found on well-stocked better sites. More trees are killed in stands that contain mainly oak species than in oak-pine or mixed hardwood stands. Subdominant trees are killed more rapidly and more often than dominant trees. Silvicultural treatment: What and when? Appropriate silvicultural treatment will be determined by an anticipated occurrence of gypsy moth defoliation, by characteristics of the stand, and by the economic maturity of the stand. Foresters refer to treatments discussed here as "thinnings." Thinnings are cuttings made in forest stands to remove surplus trees (usually dominant and subdominant size classes) in order to stimulate the growth of trees that remain. Pre-defoliation treatments. When gypsy moth defoliation is anticipated, but not within the next five years, pre-defoliation thinning to selectively remove preferred-host trees can reduce the severity of defoliation, increase the vigor of residual trees, and encourage seed production and stump sprouting. Thinnings should not be conducted in fully stocked stands that will reach maturity within the next 6 to 15 years. Thinning results in a short-term "shock effect" to residual trees. This shock effect, coupled with defoliation-caused stress, renders trees vulnerable to attack by disease organisms such as Armillaria. In fully stocked stands that will reach maturity within the next 16 or more years, two kinds of thinning can be applied. The method of thinning should depend on the proportion of preferred host species present. If more than 50 percent of the basal area in a stand is preferred host species (mainly oaks), presalvage thinning should be applied. Presalvage thinning is designed to remove the trees most likely to die (trees with poor crown condition) from stress caused by gypsy moth defoliation. If less than 50 percent of the basal area in a stand is in preferred host species, sanitation thinning can be applied to reduce further the number of preferred host trees. This will result in fewer refuges for gypsy moth larvae and in improved habitats for the natural enemies of the gypsy moth. Treatment during outbreaks: If defoliation is current or is expected within the next 5 years, thinnings should be delayed because of potential "shock effect." High-value stands can be protected by applying pesticides. In low-value stands or those that are at low risk (less than 50 percent basal area in preferred host species), protective treatments are optional. Post-outbreak treatments. After a defoliation episode, the land manager or woodlot owner should pursue efficient salvage of dead trees, but should delay decisions about additional salvage, regeneration, or other treatments for up to three years. At the end of three years, most defoliation-caused mortality will be complete and the need for treatments can be assessed on the basis of damage level, current stocking conditions, and stand maturity. This article incorporates text from http://www.na.fs.fed.us/spfo/pubs/fidls/gypsymoth/gypsy.htm, a public domain work of the United States Government. Andreadis, T. G., and R. M. Weseloh. 1990. Discovery of Entomophaga maimaiga in North American gypsy moth, "Lymantria dispar." Proceedings of the National Academy of Sciences 87(7): 2461-2465. Barbosa, P., and J. Greenblatt. 1979. Suitability, digestibility and assimilation of various host plants of the gypsy moth Lymantria dispar L. (Lepidoptera, Lymantriidae). Oecologia 43(1): 111-119. Barbosa, P., M. Waldvogel, and P. Martinat. et al. 1983. Developmental and reproductive performance of the gypsy moth, Lymantria dispar (L) (Lepidoptera, Lymantriidae), on selected hosts common to mid-atlantic and southern forests. Environmental Entomology 12(6): 1858-1862. Bogdanowicz, S. M., W. E. Wallner, J. Bell, et al. 1993. Asian gypsy moths (Lepidoptera, Lymantriidae) in North America: Evidence from molecular data. Annals of the Entomological Society of America 86(6): 710-715. Dwyer, G., and J. S. Elkinton. 1993. Using simple-models to predict virus epizootics in gypsy-moth populations. Journal of Animal Ecology 62(1): 1-11. Elkinton, J. S., W. M. Healy, J. P. Buonaccorsi, G. H. Boettner, A. M. Hazzard, H. R. Smith, and A. M. Liebhold. 1996. Interactions among gypsy moths, white-footed mice, and acorns. Ecology 77(8): 2332-2342. Gansner, D. A., O. W. Herrick, G. N. Mason, and K. W. Gottschalk. 1987. Coping with the gypsy moth on new frontiers of infestation. Southern Journal of Applied Forestry Research 11: 201-209. Gould, J. R., J. S. Elkinton, and W. E. Wallner. 1990. Density-dependent suppression of experimentally created gypsy moth, Lymantria dispar (Lepidoptera, Lymantriidae), populations by natural enemies. Journal of Animal Ecology 59(1): 213-233. Liebhold, A. M., J. A. Halverson, and G. A. Elmes. 1992. Gypsy moth invasion in North America: A quantitative analysis. Journal of Biogeography 19(5): 513-520. McManus, M. L., D. R. Houston, and W. E. Wallner. 1979. The homeowner and the gypsy moth: Guidelines for control. Home and Gard. Bull. 227: 4-33. U.S. Department of Agriculture, Washington, DC. Myers, J. H. 1993. Population Outbreaks in Forest Lepidoptera. American Scientist 81: 240-251. Podgwaite, J.D. 1979. Diseases of the gypsy moth: How they help to regulate populations. Agric. Handbook 539: 2-15. U.S. Department of Agriculture, Washington, DC. Rossiter, M.C. 1991. Maternal effects generate variation in life-history: Consequences of egg weight plasticity in the gypsy moth. Functional Ecology 5(3): 386-393. Schaefer, P. 1989. Diversity in form, function, behavior, and ecology. In USDA Forest Service (ed. ), Proceedings, Lymantriidae: A Comparison of Features of New and Old World Tussock Moths. 1-19. Broomall, PA.
Scoble, M. J. 1992. The Lepidoptera: Form, Function and Diversity, 2nd ed. Oxford University Press. ISBN 0198540310. Weseloh, R. M., and T. G. Andreadis. 1992. Epizootiology of the fungus Entomophaga maimaiga, and its impact on gypsy moth populations. Journal of Invertebrate Pathology 59(2): 133-141. This page was last modified on 2 April 2008, at 08:16.